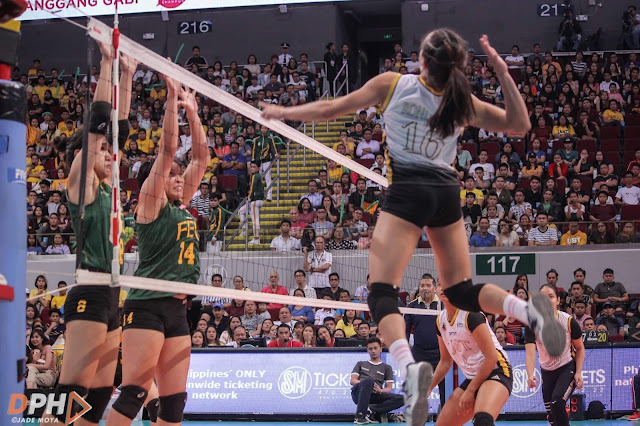 PASAY CITY - The UST Golden Tigresses get back on the FEU Lady Tamaraws after beating them on the first round and sweep the FEU Lady Tamaraws in a three-set match, 25-23, 25-18, 25-23, Sunday evening at the Mall of Asia Arena. With that Golden Tigresses win, they are now back at the Final Four on solo third, 9-4, after being at the seventh place last season and a chance to gain a twice-to-beat advantage if La Salle will drop their two upcoming games against UE and FEU. While the Lady Tamaraws is now back on the Final Four as well, with their fifth straight Final Four appearance on 8-5 at the fourth spot of the standing. Captain Sisi Rondina led the Tigresses win with 21 points, 17 attacks, 1 block, 2 service aces, 15 digs and 12 excellent receptions with the help of prized rookie Eya Laure with 17 points, 13 attacks, 3 service aces and 14 digs. Heather Guino-o is the only Tamaraw who got a double digit score earlier for the Tamaraws with 14 points, 11 attacks, 1 block, 2 service aces and 11 digs. Captain Jerrili Malabanan, Angel Cayuna and rookie France Ronquillo contributed points for the Tamaraws as well but still not enough to give them a win. UST Golden Tigresses will play their last game of the season against the NU Lady Bulldogs on April 27, Saturday, 2 p.m., at the Filoil Flying V Centre while the FEU Lady Tamaraws will try to bounceback as they will face the defending champion which is the DLSU Lady Spikers on April 28, Sunday, 4 p.m., at the Filoil Flying V Centre.